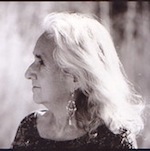 Deena Metzger is a poet, novelist, essayist, storyteller, teacher, healer and medicine woman who has taught and counseled for over forty years, in the process of which she has developed therapies (Healing Stories) which creatively address life threatening diseases, spiritual and emotional crises, as well as community, political and environmental disintegration. With her husband, writer/healer Michael Ortiz Hill, she has introduced the concept of Daré, meaning Council, to North America. She is the author of many books, the most recent: La Negra y Blanca (“a novel of the Conquest of the Americas and of hope, where wisdom leaks through misty realms between memory and imagination”). Thank you, Deena and Joanna.